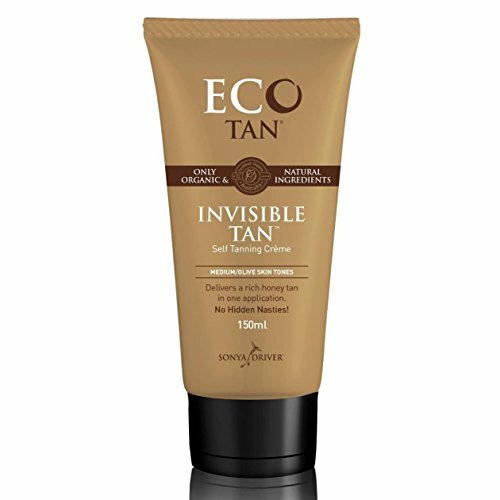 Why we love it: Achieve a sunless, golden glow with this Invisible Tan lotion from Eco Tan. Completely non-toxic, this self tanner formula uses natural Cacao to create a truly bronze tan without any of the orange or red streaks that can come from chemical based self-tanning lotions. Invisible Tan develops into a summer glow over an 8 hour period and is suitable for both face and body application. Apply to cleansed, dry skin that has recently been exfoliated. The lotion will turn white as you apply to help you achieve full coverage. Aloe Bardadensis (Aloe Vera) Leaf Juice*, Dihydroxyacetone, Glyceryl Stearate, Persea Gratissma (Avocado) Oil*, Macadamia Terifolia Seed Oil*, Glycerin*, Cetyl Alcohol, Stearic Acid, Potassium Cetyl Phosphate, Xanthan Gum, Lecithin*, Tocopherol Acetate, Chamomilla Recutita (Chamomile) Flower Extract*, Pelargonium Graveolens (Rose Geranium) Oil*, Lenconostoc / Radish Root Ferment Filtrate, Sambucus Nigra Fruit Extract, Citronellol, Geraniol, Linalool, Citral, Limonene. *Certified Organic, ** Natural.